WHEN I was little, my dad would sometimes treat us kids by packing us up in the car (already in our pjs) and driving us to the local fish ‘n’ chip shop to pick up take-away dinner on a Friday night. I remember sitting patiently on the way home with the precious dinner package on my lap, with the food first wrapped in plain paper and then twice in used newspaper to keep it piping hot. I simply couldn’t wait to taste the first bite. All these years later, here I am in Australia (not Canada) and still loving good old fish ‘n’ chips. That love took me to Catch where the white T-shirts the staff wear sport “Reel Good Fish” in blue lettering on the back. Catch busts the myth that you can’t get good fish in Canberra. The menu includes ethically sourced fish as fresh as possible to the capital, and it’s good. The place looks like it’s at the coast – with a predominantly blue, white and yellow colour scheme and big picnic tables outside. Water is served in blue and white tin cups and cutlery stacked in tin containers. It’s a fun vibe. All fish are served with chips or salad, a solid slice of juicy lemon and tangy tartare. Prices vary from $6 for hake to $23 for salmon. 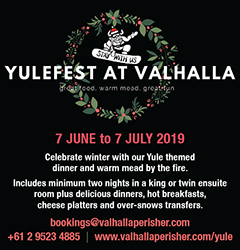 Depending on the fish, you can choose crumbed, battered or grilled. It was flathead for me, but I fussed over whether to have battered or grilled, wondering if the batter would be too heavy. I needn’t have given it a second thought – the fish was beautifully coated and the batter lovely and light. It was a generous serve – three large pieces of flathead and just the right amount of hot, chunky chips. It all came in a dish lined with paper featuring a blue pattern against a white background, reminding me of waves. 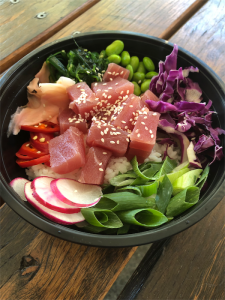 My friend’s poke bowl ($15) looked delightful. We’ve had a couple of uninspiring ones at different eateries of late, but this one came to the party with chunks of mouth-watering tuna (you can also have salmon) and loads of other goodies, all topped on rice. The chilli was super duper hot, even for my friend who chows down on chilli regularly. You order inside at the counter at Catch. Salads (Greek and Asian slaw for $7) are on the menu, as are burgers ($13 to $19). 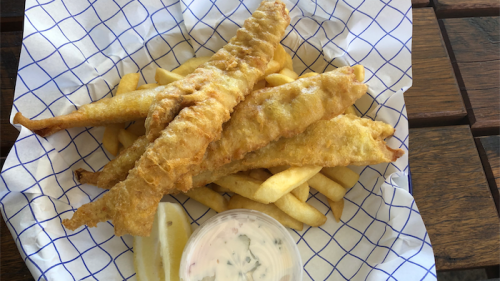 “Catch packs”, starting at $8 for the Little Nipper (four fish cocktails or four calamari and chips) and topping off at $60 for a Family Box that serves four (four fish, eight calamari, large chips, salad). Capital Brewing Co. “Coast Ale” and Batlow Apple Cider are both on tap ($8) and wine is reasonably priced ($7 to $9 by the glass). Catch, corner of Lonsdale and Elouera streets, Braddon. Open seven days, 11am until late.